Ho’oponopono means, ‘to make right,’ or ‘to rectify an error.’ According to the ancient Hawaiians, error arises from thoughts that are tainted by painful memories from the past. Ho’oponopono offers a way to release the energy of these painful thoughts, or errors, which cause imbalance and disease. 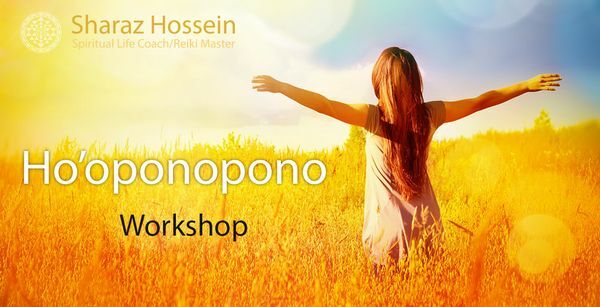 In this workshop I will be teaching the practice of Ho’oponopono. You will learn how to use it as tool everyday in your life. You will learn why you say, “I love you, I am sorry, Please Forgive me, Thank You”. You will also learn about the updated short version of the prayer and how to use your inner child to continue saying the prayer while you are sleeping or on your busy days when we feel you have no time to say it. Upon completion of this workshop you will have full understanding of the prayer and why it truly works, creating miracles in your life.